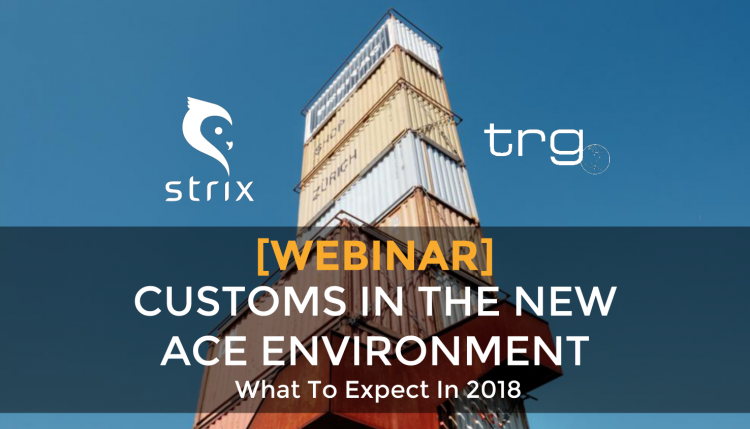 Trade Risk Guaranty hosts a webinar with Strix covering the topic of what to expect with Customs and Border Protection and the ACE Environment in 2018. The start of a new year is the perfect time to evaluate your business’ importing practices in order to strengthen your supply chain and increase your compliance with Customs and Border Protection. To help start off the new year on the right foot, Trade Risk Guaranty hosted an informative webinar on the topic “Customs in the New ACE Environment: What to Expect in 2018” to give business owners a deeper understanding of how CBP is using the data in ACE to enforce existing trade laws. 00:00 – Hello, welcome to our latest webinar: Customs in the New ACE Environment. I’m Nick Esposito, and I’ll be your host today. I wear many hats here at TRG, but one of my favorite roles is that of an educator to both my fellow co-workers and you, my fellow international trade professionals. 00:20 – Joining me today is Gregg Cummings, Managing Partner and Licensed Customs Broker from our sister company, Strix. This webinar is being presented by Strix and Trade Risk Guaranty. We are located in the heart of downtown Bozeman, Montana. 00:34 – For those unfamiliar with the area, it’s nestled right above Yellowstone National Park in southwestern Montana. If you’re ever in town, stop by our shared office space on the second floor of the historic Rocking R Bar building. Both companies operate on a direct-to-importer business model that is unique to the international trade community. As an important disclaimer, the information presented in this webinar is for information purposes only and is not intended and does not constitute legal advice. 01:03 – We will be recording this webinar and it will be available on YouTube for future reference. If you have any questions during the presentation, submit it via the questions section of the webinar. The questions will be reviewed and answered by Gregg or our team of Licensed Customs Brokers at the end of or shortly after the webinar. 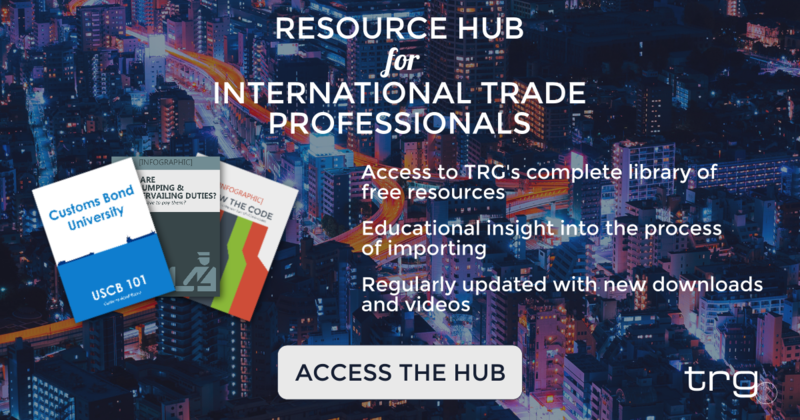 If you have any additional questions outside the webinar, or if you’d like to be a part of a community of trade professionals, join our Facebook group: International Trade Professionals – TRG. We regularly check the group for questions and encourage our members to start conversations amongst themselves, if they have a common problem. 01:37 – Without further ado, here’s Gregg to kick off the webinar. 01:39 – All right, well thanks Nick and thanks everyone for joining us today. What we’re going to talk about is ACE and there’s a lot of information that’s out there today on what ACE has been, how long it’s taken to put in place, and more importantly what’s happening now. What’s happening in the trade and perhaps to some of you as far as your import practices and supply chain. Just as important, of course, is also what are we going to expect to see out of ACE and out of the trade and this administration in 2018. What is the New ACE Environment? 02:24 – Let’s start off with an overview on ACE. So what is ACE? Well for most of you ACE is a pretty common acronym we all know. It’s the Automated Commercial Environment, but the history of ACE is actually very interesting. 02:34 – It’s the single window, that system, that all imports and exports are now being processed through. So when you file an import entry, it’s now all going to ACE. What ACE is also trying to do is eliminate manual processes and streamline us to a more automated environment, so look and continue to see the paper as being eliminated in all of these processes. 03:04 – Most recently in the past month or so you’re seeing that all in-bonds are now moving to an all-electronic environment. For many of us we’ve been dealing with in-bonds sometimes in paper form in some of our CTS’s and other entry ports, but that’s no longer going to be in place so get ready because the continuation of automation is going forward. And what this is going to do is going to allow us in the trade community to more easily and more efficiently be compliant with all our U.S. government laws and regulations. 03:45 – So what about compliance? Informed compliance is, of course, a moniker that we’re all pretty familiar with but where did it come from and it all started back in 1994 with the Modernization Act. And what happened then was, and it was kind of snuck into the NAFTA agreement of 1994, is Customs very squarely put all of the regulation and compliance requirements on you, the importer of record. That’s when you found you had to then by a Customs Bond, that, of course, didn’t safeguard you in any way but it safeguarded the U.S. government to make sure that if you didn’t pay your duties and fees, or fines and penalties if they were assessed, that they’d have a Surety to pay them. 04:26 – What also came out of the Mod Act was the idea of shared responsibility so informed compliance is that shared responsibility where CBP effectively communicates to the trade what’s expected what their regulation and accordance with U.S. laws is going to be in place and what you, the importer of record, can be expected to understand and do. And that great word that we’ve all come to know and love, you, the importer of record, taking reasonable care in your importing operations. 05:05 – So a little bit more on the history of ACE. I love this I love this line this came out in nineteen eighty-eight “Automate or Perish”. What’s the history of where ACE is today and what our electronic systems are? And, it really all started with the very first electronic approach which was the automated commercial system better known as ACS. This was put in place back in 1984 and for those of you who are been in the business kind of as long as I have to you might remember that AS400 green screen. Kind of a user-unfriendly system but yet it was automation. 05:46 – In 1988 we got a new commissioner, William Vaughn Raab, and he stated the trade better automate or they were going to perish. And it was really a great line because he stated that by 2000 paper will be nothing but a faint nostalgic memory. Now, of course, we’re dealing with U.S. Customs, U.S. Customs is the government so nothing ever really quite moves as quickly as we think it will, but what happened in the 1990s is we did begin to see a new technology and a new environment begin to emerge. We had the Internet, we had computers going on – everyone’s desktop (no more just super systems in the basement that we had to deal with). 06:30 – And what that did was it made Customs understand that this outdated environment that they were living in was going to have to change. So that’s when discussions began on the creation of ACE in early 2000s, ACE really began to pick up speed, finally and it was really post 9/11 when we saw that additional need for electronic cargo information come to board. 06:55 – So we had in 2002, a real move and this is when ISF was first defined as something that was going to help the government help CBP understand what was going to be coming to the United States. They found out very quickly that yet they looked at the information that was coming in a Customs entry they really had no idea what was coming to the United States. So ISF was one of the first and early reasons why an ACE-like environment needed to be created. Finally, four years ago, and what it really took was a presidential proclamation to replace ACS once and for all with ACE. 07:41 – So where is that project now? Well eighteen years later, four billion dollars later, and for those of you who run companies out there who are involved in large importers, you might wonder how anyone could spend four billion dollars on technology, but then again it is a government project. So yes we’ve spent four billion dollars on ACE, but the good news is we’re finally nearing full deployment. 08:07 – Now as we know there’s two sides to a Customs entry; first we’ve got Customs information, what is CBP looking for? And there’s a whole set of data that they are interested in prior to clearing your entry. But what we also know is that there are 41 government agencies out there that also perhaps want to see something about your entry. These used to be called Other Government Agencies, today they’re now called Partnering Government Agencies. 08:39 – So what ACE is doing is it’s creating a single window and the ITDS, that’s International Trade Data System, is going to provide that single window into everything and all the data that is being put together for that Customs entry. So we’re now going to be simultaneously transmitting and actually have been in practice both the Partnering Government Agency information and the Customs information in one transmission, through ACE. 09:10 – So what does that mean? Well first let’s take a look at some of the data that’s part of your Customs entry and what the introduction and what ACE is going to do with that data and how it might affect you. So the MID number lets Customs know who you’re bringing your goods in from, who’s the manufacturer, who’s the supplier of the goods that you bring into the United States. 09:36 – So every one of those has an alphanumeric code up to 13 characters that defines to Customs who that manufacturer or supplier is. Its required on every CBP entry, and if you look in box 13, for those of you familiar with your 7501, there is your MID. In an ACE environment, what’s happening with these kinds of data. Well Customs now has the ability to very closely monitor and, if necessary, scrutinized and even target a manufacturer or supplier based on that MID number. 10:15 – What does that mean for you? Well let’s take a look at a couple of scenarios in the old world and that in that more fuzzy data world of ACS, MIDs were out there, but Customs didn’t have any good logarithms to be able to search through them. Today they do okay. So let’s take a look at importers 1, 2, & 3. They’re bringing in information, they’re bringing in data and goods that are not subject to PGA, its not subject to anything just Customs information. 10:50 – Okay, so Customs has the manufacturer, the MID. What does Customs care about? They care that you’ve classified the goods correctly. So what can they do today and what are they doing? Today they’re taking a look at that MID. They’re taking a look what you’re bringing in, how you classify it, and also what your competitors are doing. You might imagine that you’re not the only one bringing goods in under that manufacturer, that MID. So they’re going to take a look at how you classify it, how other importers classify it, and then take a look at what they believe the correct classification is. 11:28 – So they’re much more capable of going out and taking closer looks at how you compare to what you’re doing with other companies bringing in goods under the same manufacturer. Other items of import anti-dumping, you might be bringing goods in under a specific classification, but bringing them in for consumption and not an anti-dumping entry, okay. Anti-dumping is a bit more complex, it requires understanding the scope but you, the importer of record, this is kind of like a tax return, you’re the one who decides am I subject to that scope or am I not subject. 12:09 – What can Customs do and what are they doing today, they’re taking a look at whether or not you are bringing them in under anti-dumping or if other importers bringing in the same goods with the same classification under that same manufacturer are bringing them in under anti-dumping. So they’re looking closely at that, this is a big revenue piece, and so Customs can very clearly identify that. They’re also taking a look at Free Trade Agreements GSP is very common out there. 12:40 – For those of you subjecting yourselves to entries today with GSP there was a glitch in the Custom system and GSP, all GSP were being initially rejected by Customs luckily that’s been fixed, but GSP has been one of those tough things that require passage by Congress and they usually never get it done by the end of December and so we have to enter our goods under a GSP with a squiggle line so we can get the Customs duties and fees returned to us at a later date. But Customs is doing the same thing for Free Trade Agreements. They’re taking a look what importer three might be doing and whether or not he is or is not subjecting that tariff to a GSP out of a particular country, and whether or not others are. 13:30 – So Customs has it better than any time in its history, the ability to mine data on what you are doing. CBP goes through the targeting analysis through what’s called ATS, the Automated Targeting System and they’re going to go through and determine if they’re going to examine certain shipments. Every inbound shipment has a risk score associated with it and it’s based on what came out of the ISF and what other consignment and logistical details are part of that bill of lading and part of that shipment when they roll that all together, and they do this literally in milliseconds now, then they can determine if they need to to bring those goods aside, and set up an exam. 14:19 – Now most exams today are handled through VACAS, through an x-ray, but you will also be able to learn much earlier than you have in the past if your goods are subject to those exams and or if that exam moves from a VACAS to a more detailed exam. Other exams are more random, and they’re going to continue to be random because Customs wants them to be. So it’s kind of like a lottery. 14:44 – You get set up by what’s called selectivity and there’s not really a defined reason why you might get selected, it’s entirely at random. So that’s not really changing or more enhanced by what’s currently going on out there. But one of the critical factors of course is by taking a look at that MID. So the ability to look at MIDs across the entire spectrum means that Customs can take a look and see, now, did that MID have a prior? Is there is there a problem that’s been happening with other importers bringing in goods in from that manufacturer? 15:24 – I can tell you as a broker we get questions all the time, “You know Gregg, I was bringing in goods in 2016 and I never really had a problem but in 2017 I’ve seen my exams start to peak up. I’m not really sure why, can you tell us why? What do we need to know about what we’re doing?” And so when you take a look at that, there are some things that are going to potentially be in your control, there’s going to be some things that remain out of your control. 15:53 – One of the things that’s that’s outside of your control of course is whether or not a competitor brought a good in and classified it incorrectly, whether or not the actual manufacturer of the good has done something to peak more close scrutiny by CBP. These aren’t things you can really control but they might be affecting your import in your exam likelihoods. Other things are whether or not you as an importer have a good compliance record with Customs, that is something you can control. 16:24 – So it’s why you always want to make sure that you’re classifying your goods correctly, and you understand the scope of free trade agreements and/or anti-dumping, if you may or may not be subject to it. The days of kind of getting away with things are very quickly coming to an end with the kind of computing power that Customs has today. 16:47 – So what’s going to happen in 2018 where are we going from here well here’s what we can expect the current administration, love them or hate them, are continuing on what’s been a pretty defined path. 17:01 – We know first and foremost that that this administration wants to enforce existing laws. If it’s on the books, they want it to be enforced. And they pretty much made no bones about that. Up to this year up up to the end of 2017, have they actually been doing more of that? 17:21 – Well thankfully with any administration that comes in changing the direction of the boat remains a very slow process because you’ve got bureaucrats and people in place everywhere and no one ever moves that quickly, but the boat is beginning to move. And we are seeing greater scrutiny and enforcement of existing laws. 17:44 – In particular, there’s been a lot of scrutiny on anti-dumping and countervailing, and free trade agreements. We see that through direct communication from the administration and we see that being acted out either through CF-28 and 29s as well as through the Department of Commerce. I can tell you what we’ve seen as a broker out there. 18:10 – Enforcement on anti-dumping has skyrocketed, and again we see this as Customs having greater access and scrutiny of their data, being able to mine it better, and they will go out and we’ve seen more CF-28 asking about documentation and the details of a shipment, and for those of you who actually want a bit more of the of the IT detail on ACE one of the nice things that’s different today about the ACS environment is the ability to upload all your commercial documentation very quickly and electronically to Customs. 19:17 – Well in the old days that would you’d have to make a copy of that, put it in a packet, send it off to Customs, the delays on that were you know three to five days sometimes a week. Today we can do it in a matter of minutes because you just simply copy and upload that documentation directly through PDFs and whenever, whatever, other format it may be in and Customs can take a look at it very quickly. 19:41 – So they’re seeing now the the original documentation as you’ve received it directly at the Import Specialist level so they can look at that they can compare that to other data that they might be seeing from other manufacturers and other commercial invoices, similar to other people who are buying through the same manufacturers, and they can look at them. And if they see a something that is very clearly in their minds anti-dumping, you’ll get a CF-29 and you’ll be asked to change that entry. 20:13 – So we’ve seen that jump a lot and really when you think about it Customs certainly is an enforcement arm of Department of Homeland Security, but it’s also a revenue generator. And there’s a lot of money in anti-dumping and there’s also be proven to be a lot of people who have been avoiding anti-dumping and so that’s been that’s been a big jump. 20:37 – Now another very big change that we’ve seen recently is, if you look at anti-dumping, cases that are brought and inquiries by the Department of Commerce are usually initiated by a U.S. firm, let’s say ABC Aluminum out of Pennsylvania, is has doing business domestically and all of a sudden they see Shenzhen Aluminum send product into the into the country at a very low cost. And anti-dumping of course isn’t based on cost it’s based on whether or not that foreign that foreign supplier is delivering the goods here below its cost. Which would suggest that it either made too much and it’s dumping the goods here just to get rid of it or if they’re actually being subsidized by that foreign government. 21:29 – Ok, so that’s a direct harm to free trade and fair market value. So Customs cares about fair market value when they take a look at anti dumping. So in the past again you know a U.S. firm who believes they’re being harmed would bring that to the Department of Commerce and that might initiate a case. What’s different? 21:48 – Well we’ve begun to see the Department of Commerce initiate anti-dumping cases on their own, and most recently in the past month we’ve seen this in the aluminum sector. Where Department of Commerce has gone out and actually begun to review pricing and shipments to the U.S. without any U.S. suppliers initiating cases. So you know can we expect that to continue into 2018? It would seem so. 22:16 – So make sure that the classification and your understanding of the scope, if you might be subject to anti-dumping, make sure you understand it and make sure you’re in compliance. Because if Customs takes a look at this and they believe that you’re trying to skirt anti-dumping rules, they could also, in addition to the anti-dumping duty, give you negligence or gross negligence which is an additional fine and penalty. 22:46 – So what can we continue to expect? Well understanding that the transformation of Customs, and CBP through ACE, is in place getting better and it’s going to continue to affect you as we move forward. We call this kind of the triple play. We’ve got better data more sophisticated mining tools in place today, and being used. 23:07 – We’ve got the Commercial Targeting and Analysis Center using those tools and then going out and setting exams and, where necessary, assisting Customs where fines and penalties might be assessed. They’ve also initiated the Centers for Excellence and Expertise also called CEE. Now this is a relatively new idea at Customs and the initiation of this is actually a good one. 23:36 – In the past for those of you who who might bring goods into a number of ports, you might have experienced what what can most nicely be called nonstandardization between ports. And it’s kind of been kind of a joke because many of the port’s you know kind of operated as their own little fiefdom. A good example of this, if we’re bringing goods into both the port of Seattle and the port of LA, we might have gotten a note from LA saying ‘Hey, we’re instructing you to bring these goods in under tariff code 9050’, and thus you duly do that, tariff on that is 3%. Bringing goods into the Port of Seattle, you might receive an alternative instruction to bring those goods in under tariff code ending in 9080 at 5%. Well Seattle is telling us one thing, LA is telling us another thing. What are we going to do? Well it doesn’t take most of us in the entrepreneurial world to start sending all of our goods to LA, right? 24:42 – So certainly Customs began to understand this and they began to understand that it wasn’t good for the trade in general to get conflicting information. Another way that this bore out was recently when there was the West Coast strikes. So a lot of people, at least those who acted very quickly, were able to divert from the ports that were under strike on the west coast up to Vancouver and bring goods in Vancouver and then rail them across Canada and bring them into to the U.S. through one of the northern borders. So we had a case where a steel manufacturer did that. They landed in Vancouver railed it across the top of of Canada and brought it down through North Dakota and the import specialist in North Dakota had never seen a steel shipment, asked for a little more information, dug into that and said ‘Hey, you know what I think this is subject to anti-dumping’ and gave a CF-29 directing them to bring that under as anti-dumping. So what they had been doing for years and years and years through LA with one tariff code not anti-dumping suddenly became a big deal. 25:55 – So the Centers for Excellence and Expertise say you know what we understand at Customs, last year there were 40 million entries into the United States, and Customs understands there’s no one group of people at a port that can possibly understand the detailed and increasingly technical information that are involved in how goods are classified, as well as the broad range of goods that are coming in. So the CEE is designed to assign an expert to the area of goods you’re bringing in, FDA is an important one, if you’re bringing in food you don’t want to steal expert taking a look at whether or not the tunafish you’re bringing in from China should be subject to anti dumping or not. So net it’s a good thing. 26:42 – You might also understand that the more expert that Import Specialist is and looking at your goods, the better they are to understand whether or not it’s been classified correctly or may fall under the scope of anti dumping. So again, you know compliance, compliance, compliance. The more that Customs creates sophistication in the way they’re able to look and review your data the more that they’re going to expect and be able to give you the correct classification how you’re good be brought in. So this is a very strong force multiplier in ferreting out what trade compliance errors and fraud might be being subjected up there. 27:59 – Now in addition, Customs has asked that you sign and return those letters to them. So what does all this mean? Well if you get one of those letters, you can talk to your own legal counsel about whether or not you should sign and return it. We might counsel that you think about whether or not you want to create a written record of that. But in light of that, you are very probably a strong candidate an audit. 28:27 – Whether it be a focused assessment or a quick response audit. You know again with 40 million entries coming to the United States a year, Customs is not sending out a letter to you because they miss you. Sending out a letter because they’ve probably taken a look at your data and they think there’s something wrong. So if you see something like that you better take a look and really do a thorough review of your entire import program and focus on what you think the areas of greater risk are what might have been outlined in that letter. Because the first thing that you might find, is you might find some mistakes you know many of us are bring goods in under classifications that may have been done under predecessors, they might have been in place for a long time, we may not have questioned these and classification does change. Duties and fees do change. And so scrutinizing your your import practices may find a mistake. 29:23 – What do you do if you find that mistake? Let’s say let’s say we’ve been bringing it under 9050 but it really should be 9080, not 3% but 5%. Well Customs creates what’s called a Prior Disclosure opportunity for you and what that says is that if you disclose the mistakes that you’ve made to Customs about a violation, either orally or in writing, then Customs cannot go after you for more than just the difference in the duties and fees that you owe. They won’t go after you for negligence or fraud, okay. So it’s an important opportunity if you do find a mistake to kind of tell on yourself and if you do that the only thing will be what you technically should have paid in the beginning right. No fraud or negligence or greater fines and penalties. 30:13 – If you do receive a letter, again the bottom line is you’re on CBP’s radar. They’ve seen something and this should cause you concern because it’s probably caused them some concern. If you didn’t receive one, and most of you probably haven’t, do watch the mail room. And another thing about watching the mail room, Customs may send out letters and information to you and when they do they expect you to have a process in place to receive it and to read it. Certainly if you get a fine or a penalty and it ends up in the mail room and you never see it, that’s a problem. So have that process in place understand that where mail comes into and whomever is taking a look at that, if you see anything from Customs and Border Protection, there is a primary and a secondary person that that should be delivered to. 31:11 – So you never miss any communications from Customs. It’s worst case, if information Customs sends you get gets returned, they’ll actually reject your bond for a period of time until you update your name and address. So you always want to make sure that that information is being received and being read as timely as possible. 31:32 – So what are our key takeaways? ACE is very close to being fully deployed. So understand that this new system and the processing centers are catching more errors than they used to and they’re going to be looking and getting much better in finding them. So it’s a great time right, the end of the year is a great time to take a look at what we’re doing next year, take a look at our compliance protocols, and review them. Are we doing everything we can to make sure things are being classified correctly, that our entries are being done correctly, are you auditing your brokers, are you making sure that they aren’t making any mistakes in your classification? 32:13 – Remember you, the importer of record, are ultimately responsible. So even if I, as a Customs Broker, make a mistake when I put your entry together, it’s you who will receive a fine and penalty. Okay now there are a lot of systems in place to go back and do updates, post summary corrections to entries that were done incorrectly. But a lot of times you the importer of record have to have systems in place to audit and make sure that you’re taking a look at that. And of course, as we said take those compliance letters seriously. Discuss it with executives and keep an eye on that mailbox. 32:51 – So here’s what we’ve covered. We’ve covered what ACE is, the history of it, where it is now, where we’re going in 2018, and we’d like to open it up to questions now. We’ve received a couple already in written format, but if you’ve got some questions please chat them up right now on the right side of your box and we’ll try to get to them, depending on how many we have, as quickly as we can. 33:14 – So we’ll give you a minute or two to do that just a quick overview on Strix Brokerage and software. That’s who we are. We are a full-service Customshouse Brokerage. We make entry at all U.S. ports; ocean, air rail, and truck. And any PGA documentation that may be a part of your entry is also seamlessly put into our software and our entry filing. And we have very competitive pricing. As Nick said at the beginning here, we sit here in Bozeman, Montana so we don’t have a high price for office space like people on the two coasts do, so we’re able to do a really great job at a really competitive price. 33:54 – And for those of you who want to walk forward and bring that process in-house, our software allows you to self file either your ISF only, or both your ISF and your Customs entry. And you can see full up to about eighty percent of a cost savings by bringing those services in-house and doing them yourselves. And if you do, you have access to full customer service, with all of our for all our self-filers, with our Customs Brokerage and Licensed Customs Brokers. So appreciate that look. 34:21 – I’m going to hit on a couple of these questions that were written to us early. Chris writes us: ‘You know how do we anticipate anti-dumping with the new administration?’ You know, I think we covered that pretty well. They care. They care a lot about it and they’re able to mine that data better than they’ve ever been. So if you think that, and tariff codes will always target and let you know if you’re goods may be subject to anti-dumping. Take a look at it, read the scope very thoroughly. If you want a second opinion we give them all the time on whether or not you may or may not fall under the scope. Sometimes that can be quite technical and you really have to look at engineering specs and look at exactly, you know, is it a certain percentage of water in a dumpling? You know, that’s how that’s how technical some of this stuff gets. So yes, new administration does care and will continue to care. 35:19 – Vince asks you know, ‘Is there any new compliance issues for the auto industry?’ We have, we have seen some parts in the auto industry that are subject to anti dumping. I haven’t seen anything entirely specific to the auto industry. I know that EPA is getting a little bit more robust as a PGA requirement for documentation, but nothing that’s really over the top. 35:51 – Shannon asked us, ‘Where the related party has identified in ACE?’ it’s really not identified in ACE, it’s identified in your Customs entry and it’s just a data point that we put in place when we file an entry, but Customs cares. Customs cares a lot about whether or not you’re related to that manufacturer or supplier because Customs cares about fair market value. And they always take a look, perhaps a little bit closer look, at what that price point is because there’s been a preponderance of sweetheart deals, of course, between related parties because they can do a little internal accounting. So Customs does care very much about whether or not you’re a related party. 36:36 – Sarah asks us, ‘How will C-TPAT play a role?’ You know, that’s a really good question and I really can’t tell you whether or not this administration or this new CBP and the people running it are going to give some greater strength to C-TPAT. They’ve sold that to the industry, they sold it early, by saying hey become C-TPAT and you know your imports are going to be streamlined. The fact is unfortunately that we’re not sure the trade has really received that. Really seen an easier path, you know your fines and penalties are 25%-50% discounted which hopefully you never get to, you know, has this really helped me bringing goods in. And what we’ve communicated back to Customs from our point of view, you know, we should be making this very clear to the trade. If we go to the all the time and expense of becoming C-TPAT, we ought to see the benefits, they ought to be clear. We ought to be at the front of the pack, we ought to be getting things moving through more quickly. We’ve seen in some cases some very large importers, people who you would think C-TPAT would be a no-brainer, kind of walking away from it. And when they let Customs know that they walked away from it, Customs didn’t really come back begging them to stay or anything like that. So you know, I don’t know what to say about C-TPAT. If you are, you know, I guess my sense is that you stay C-TPAT because it just seems to make sense. But I think Customs has some work to do on making that be a true benefit to the trade. 38:21 – ‘What changes will affect Canadian importers?’ There’s no there’s no specific changes to bringing goods in from Canada. You know, if you’re bringing in truck goods, the e-manifest now makes that very easy. But we’ve not seen any changes at the Customs level that’s going to make it any easier or harder for our Canadian friends to bring goods in. You know, if you’re talking about NAFTA? NAFTA, of course you know, was very big in the precursor up to the election. Thankfully, as we’re seeing in many aspects of new administration’s, things are moving extremely slowly and NAFTA would have to be a complete rewrite, would have to be congressionally approved and pushed through. So I’ll leave it up to you as to how you think how quickly that’s going to happen given the fact we can’t get a tax proposal through. I think we’re pretty safe for the time being on that. So, you know, keep our fingers crossed and hopefully that will kind of remain in place. 39:28 – ‘What happens if a Broker gives Customs wrong info?’ Again, you are the importer of record. It is up to you to make sure, through you’re auditing of your broker, if your information is correct from a classification, or whether or not you’re subject to anti-dumping and free trade agreements. You know, as a broker we spend a lot of time communicating with our clients, trying to understand them as best we can. At the end of the day, you know your business better than anybody can. You’re in it every day so you know with detailed specificity, sometimes, engineering and aspects to your goods that we hope to know as best we can. But you’re gonna know best so have a partnership with your broker if you’re using a broker. If you’re a self filer then, you know, you’re already bringing that in-house and understanding that yourself. But that relationship between Customs and the broker is really Customs and you. Because you’re the one who’s responsible. So, you know, if you don’t have robust auditing in place it’s something that should be an important part of your compliance protocol because you want to know. You want to know if things are being done well and correctly. 40:42 – Talked a little bit about NAFTA. We have a specific question about ‘Whether or not the forms will still be relevant?’ And right now NAFTA remains in place. There’s no changes to it so we’ll see if and when anything happens. I would tell you it’s years, I would be very surprised if anything happen anytime soon. 41:02 – So we’ve got one question says ‘Is it possible to determine who are the shippers that have had a risky level of priors?’ Great question and the answer is no. I’ll tell you why. You know, as a broker, if we see things change, we always call customs. And we’ll call specific ports if we see exams increasing and we’ll try to understand, hey you know what’s different why why did you tag this for exam? And we’ve been, you know, we’ve been in place for a long time and of course it’s a little game of cat and mouse because Customs never tells you because they don’t want you to know. They don’t want you to know because they do have a way that they mined data and their way and the way that they look at things that they don’t want you ever to know about. So it’s tough because your manufacturer may have done something that has created greater scrutiny for some reason you have no idea about nor can control. And there’s no way to look it up we can only kind of get to it experientially, so you know I’m not sure I’m not sure I’ve got a great answer for that to help you. You just kind of have to monitor it and sometimes even have a discussion directly with the manufacturer hey what’s going on? You know, are you doing something differently that is causing Customs, are you seeing or hearing from your other customers that Customs is targeting you? And sometimes it may take that manufacturer to actually call Customs and say hey what are we doing wrong here? What’s different? You know, is our packaging different or something like that, that we can change or that would help this not to happen. You know, that one of the one of the other areas that gets target of course are royalties and trademarks. And if you change packaging or if you don’t have the correct documentation coming in sometimes this is part of the auto industry then Customs will stop you and they’ll take a look. You know do you have the correct documentation for that trademark? 43:03 – ‘Is anti-dumping information found in the language of the HT schedule? Where does one determine that?’ Okay good question. Anti-dumping is something that comes out of the Department of Commerce. HTS, the classification of your good, is something that kind of gets initiated out of of Customs. So the Customs classification for your good will tag whether or not the Department of Commerce has deemed that that tariff code may or may not be subject to anti-dumping. If you, and you know as a broker with our software defines whether or not it could be, if we get that tag we always talk to our importers directly and say okay this could be tagged let’s take a look at the scope. Let’s take a look at the engineering and the details of your product and let’s determine whether or not it falls under that scope or not. So the scope is we’ve got our software has a very detailed list of the scopes and easy access to it so and I would expect a you know outside Customs brokers have similar information they’re just not located in the same place so the HTS tags that it could be and the scope for anti-dumping cases and information will will be the place that you have to go to see. 44:23 – All right ‘If you have to make prior disclosure and a post and readjustment without Customs contacting you does that increase your level of future audits?’ Now that’s a very good question I think that logic would tell us yes and you know post summary Corrections that’s one thing you know that may or may not you know target Customs taking a closer look and setting you up for a focus assessment, but certainly a prior disclosure will cause direct scrutiny on whatever that issue is so you know one of the important things to understand is all right I find a mistake and all right I should have done this at 3% it’s really 5% I’m gonna make a prior disclosure I’m gonna push that through to Customs and tell them myself okay and then hoof it’s kind of over here’s your check Customs let’s move on. Well Customs might say hey you know what 9050 on a 9080 they did here let’s take a look at this product over here let’s take a look at this product over there so what you have to understand with prior disclosure is you know certainly it’s important that you found that mistake and you’re taking care of that specific mistake but you really have to cast a broad brush and take a look at everything because if there are mistakes elsewhere you’ve got to make sure that they’re included in the prior disclosure too because if Customs comes in and gives you takes a look at this then then a fine and penalty beyond what the duties and fees are owed quite possibly could be assessed all right. Well I think we’ve I think we’ve gotten through most of our questions there might be some specific ones here that we’ll get back to you personally on a detailed level since it might involve privacy. 46:15 – As far as what you’re doing but like to thank everyone appreciate the time today and Nick I’ll kick it back to you for the closure. 46:23 – Thanks Gregg! Thanks everyone for attending today with our webinar if you have any questions don’t hesitate to reach out to Gregg you can get them at inquiry@strixsmart.com it’s on the screen right now also you can find us on Facebook, Twitter, and LinkedIn check out our websites. We’ve got a whole line of webinars on our YouTube channel just search for Trade Risk Guaranty. Have a good one! 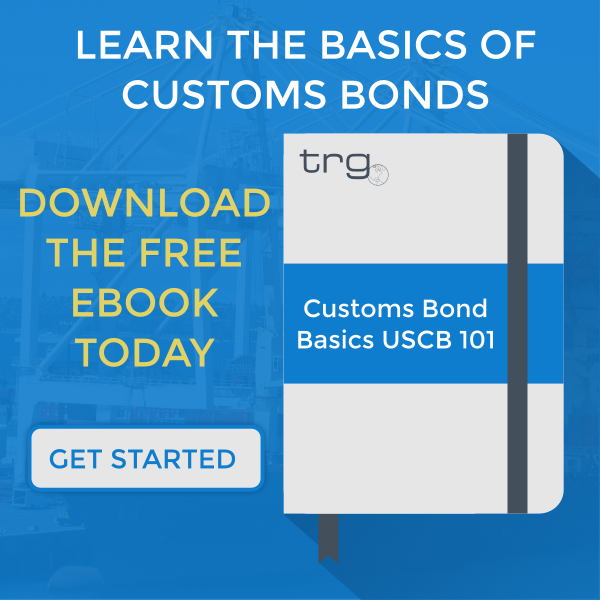 [Video] What is a U.S. Customs Import Bond? How will the 2018 Government Shutdown Affect the Trade Industry?